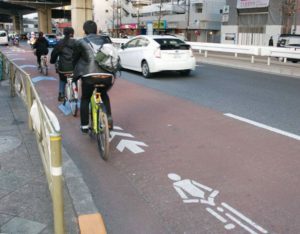 Horrified by the huge court damages being awarded over bicycle-related accidents, cyclists in Japan are rushing to buy exclusively designed liability insurance. Sompo Japan Nipponkoa Insurance Inc. has concluded 400,000 new bicycle insurance contracts since fiscal 2017 kicked off in April, surpassing the 300,000 or so contracts signed the previous year. Tokio Marine & Nichido Fire Insurance Co. said it posted year-on-year growth of 30 percent in the category in fiscal 2016, while Mitsui Sumitomo Insurance Co. said it logged 20 percent growth the same year. The brisk figures, however, also reflect governmental efforts to promote the insurance, people familiar with the matter said. 1. Do you use a bicycle? When and how often do you use it? 2. Can you remember these incidents? – (Kobe) In 2013 the mother of a 5th-grade boy who crashed his bicycle into a woman had to pay about ¥95 million in compensation. – Tokyo District Court awarded ¥47 million in damages to a rider who hit and killed a pedestrian woman at a pedestrian lane. 3. In most accidents involving bicycle riders, what are the key factors leading to those incidents and who are mostly involved? Do think it is the rider who is always at fault?